+ 4 = six Required Please enter the correct value. Crude oil prices spiked $2.13 to $106.53 Thursday morning, putting the commodity at levels not seen since September 2013. Sending oil prices soaring was the Organization of the Petroleum Exporting Countries' (OPEC's) meeting in Vienna on Wednesday and the growing unrest in Iraq. Chaos unfolded Wednesday in Iraq as militant forces moved closer toward Baghdad, seizing key cities. It's looking increasingly likely that Iraq is headed for civil war. The grave situation presents U.S. President Barack Obama with a new foreign policy dilemma. If militants threaten Baghdad, the United States may have to use air power to support Iraqi security forces, James Jeffrey, a former U.S. ambassador to Iraq, told USA Today. "This is the biggest regional crisis in the Persian Gulf since the fall of Hussein and will dramatically influence both politics and oil," said Dr. Kent Moors, Money Morning Global Energy Strategist. "The market continues to misunderstand the net impact here. Based on the range of conversations I have had with contacts in the region this morning, however, this is a full blown crisis likely to impact both policy and energy matters in a much wider area." Indeed, a civil war is likely to have a ripple effect on neighboring nations and could choke off a big chunk of the world's oil supply. If Bagdad loses control over the country's lucrative southern oil fields, which supply all of Iraq's exports (roughly 2.5 million barrels a day), the global oil supply will be severely pinched. Iraq may evolve as a "significant wild card" in the oil markets, oil trading advisory company Ritterbusch & Associates commented following the critical situation in the Middle East nation. Oil prices are poised to climb if tensions continue to rise, the firm said. Since the start of the year, West Texas Intermediate (WTI), the most actively traded oil contract, is up 8%. 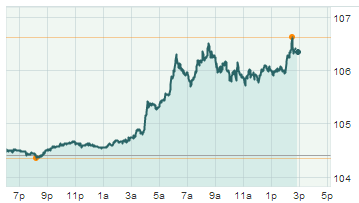 Brent futures are up roughly 4%. More gains are likely – at least in the short term. "If the Iraq situation gets even the slightest bit worse, [prices] will break out to the upside," John Kilduff of Again Capital told CNBC. "If things keep going where they're going, there's another $5 to the upside." Yet, Brent could quickly reach $125 if the situation worsens, Kilduff added. As geopolitical tensions rise, so do oil prices.